System ED50 Zone 32, x=727243, y=6096798. Coastal cliff in which a complex of thrusted and deformed glacial till and drift interbeds, as well as subordinate lake deposits are sandwiched in between giant glacially thrusted and deformed blocks of Early Maastrichtian Chalk, which is again discordantly overlain by glacial drift. The glacial interbeds are from the Early and Mittel Weichselian and constitute the slip surfaces of the thrusted chalk blocks. The Weischelian deposits constitute seperate cliff exposures at Klintholm. The cliff exposure and the hindland is divided into three sections according to the glaciotectonic situation. The Southern section with imbricated chalk blocks is built by ice push from Southeast, in the middle section giant chalk slabs are stacked, and in the northern section the chalk blocks have undergone complex deformation related to ice push from Northeast. The chalk is coccolithic, friable, and has a porosity about 50%. The chalk containes a rich and generally well preserved fossil fauna of body and trace fossils. Sparse flint layers enhance the visibility of the bedding of the chalk. Deformed, thrusted, imbricated, and stacked blocks og Lower Maastrichtian Chalk, which are interbedded with Glacial drift and till. The Møns Klint is the most spectacular glaciotectonic example in Denmark, but is in its extraordinary tectonic quality comparable to Hanklit, Silstrup, Mors, and Fur (GS 3-1 to 3-4). The chalk thrust flakes expose the complete Lower Maastrichtian stratigraphy with a rich fauna. This succession is not exposed anywhere else in Denmark. Spectacular glacial thrust flakes of chalk interbedded with glacial deposits. In Denmark: Hanklit, Silstrup, Mors, and Fur (GS 3-1 to 3-4). 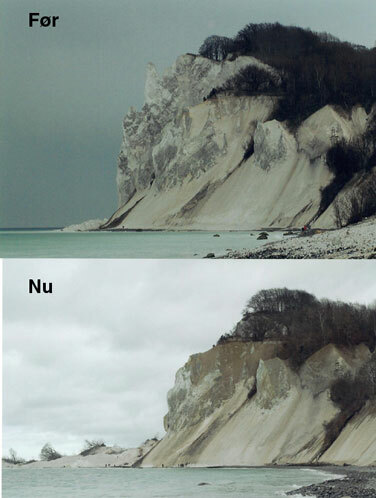 Outside Denmark: Comparable chalk is exposed at Rügen. Up to ca. 120 m above msl. Paleontology, Startigraphy, Glacial climatic history, Denundation processes (see photo below), History of Geology (Historic basis for the discussion of the theory of glacial periods). Mogensen, A.T., Fougt, H. & Hansen, C., 2000: Geologiske interesseområder. Storstrøms Amt. Dansk Geologisk Forening & Det Kongelige Danske Geografiske Selskab. Based on Damholt, T. & Heinberg, C., In: Geologisk Set, Den sjællandske øgruppe (in prep 2006). Møns Klint is a GeoSite. The Møns Klint proper and the Klintholm Klint are suggested to constitute óne GeoSite together. Photo: Ole Bang (Camping Moens Klint).